Do you have a passion for beautiful papers, gorgeous embellishments and elaborate typestyles? The previous owners of this website had a goal to create unforgettable and stunning stationery that reflected the vision of each of their clients. This website offered a great little business where the owners can use their creative side and show their artistic flair. 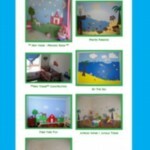 The original products were sold on the website to decorate baby’s nursery and children’s bedroom with beautifully designed mural wall art.